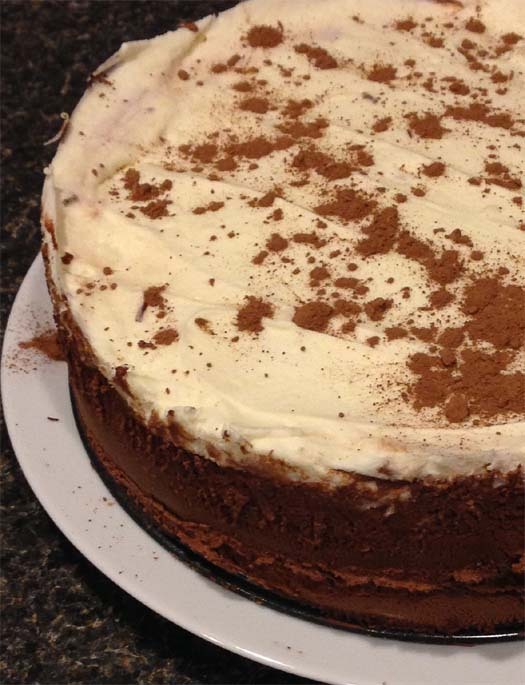 This 3-layer cake has a white chocolate mousse top layer, a dark chocolate mousse middle and a bittersweet chocolate cake bottom (flourless). This delicious dessert is something I made this past Christmas. But it's great for any occasion, especially for chocolate lovers. The recipe is from cookiescupcakesandcardio.com. And the site owner, Jennifer Johns, has a cookbook for sale on Amazon, titled Happiness is Homemade. Although I don't have the book, I imagine it to have all kinds of delicious recipes for any occasion, just like her website. 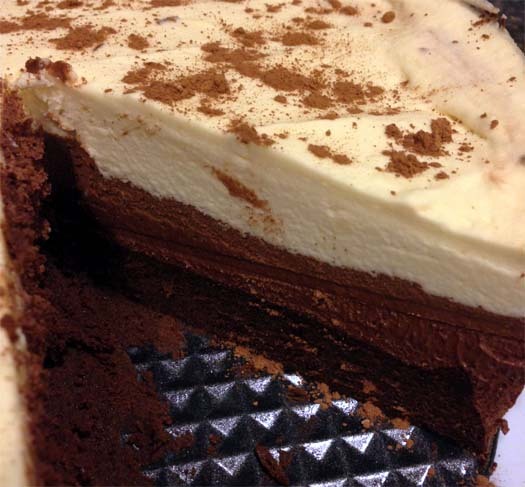 As my usual thing when looking for something new to make, I found her video tutorial (see below) for this triple layer chocolate mousse cake from YouTube. Use a microwave and microwave-proof mixing bowl to melt chocolate, espresso powder and butter. Mix till well-combined and let cool for 5 minutes. Separate eggs in two bowls: yolks only and egg whites only. In the yolks only bowl, add vanilla and whisk until well-combined. Then pour into the chocolate mix. Stir well. Using a stand mixer with a whisk attachment, combine egg whites and salt. Whisk until frothy. Add half measure of brown sugar. Whisk for 30 seconds. Add remaining brown sugar and continue whisking until soft peaks begin to form. Scoop out 1/3 of the egg white mixture and stir it in with the chocolate mixture. Mix until color begins to blend (no white streaks). Finish the chocolate cake batter by adding the rest of the egg white mix. Continue to stir and fold using a rubber spatula until completely blended. Pour batter into greased 9"x 3" springform pan and bake for 30-40 minutes. Remove from oven and set aside to cool completely. Mix the cocoa and water together and set aside. Similar to above, melt chocolate only in the microwave using a heatproof bowl. Stir until mix is smooth. Using a stand mixer, whip the cream, sugar and salt together until soft peaks form. Mix the cocoa powder mixture into the melted chocolate until well-blended. Scoop out 1/3 of the whipped cream into the melted chocolate and stir until lightened. Add the rest of whipped cream and mix it in with a spatula until no white streaks remain. Spoon middle layer mixture on top of the cooled bottom layer and refrigerate until set (about 30 minutes). Mix gelatin and water in a small bowl. Let set for 5 minutes. Place white chocolate chips in a mixing bowl. Boil 1/2 cup of heavy cream and pour on top of white chocolate. Add gelatin and mix until chocolate is smooth. Whip the rest of heavy cream in stand mixer until soft peaks have formed. Add one third of the whipped cream into the chocolate and stir until lightened. Add the remaining amount of whipped cream and fold with a spatula until well-blended (no white streaks). Scoop mixture on top of the cooled middle+bottom layer and refrigerate until set (about 2-3 hours). Garnish as desired before serving. The video goes on with a super pretty decoration. I took a shortcut and just sprinkled chocolate powder. Just be sure to use a warm knife when cutting. Hotter is better for cleaner cuts. Making this cake takes a few hours of prep time and, at least, a couple of hours for cooling. The instructions are easy to follow, but prepare enough time accordingly. Best to make it the night before a party. For a different type of cake, see this recipe for a raspberry crepe cake.